We've known for several months that Mitsubishi was at the 2019 Geneva Motor Show. Given Mitsubishi's recent history of, we didn't have much faith for this Geneva-bound concept. Boy, we were wrong. What you see here is the Mitsubishi Engelberg Tourer Concept, a four-wheel-drive, plug-in hybrid SUV. The Engelberg gets its name from a ski resort in Switzerland known for its grand panoramic vistas. We don't know if Mitsubishi will keep the name for the production version but we would . Mitsubishi says the Engelberg is powered by a new Twin Motor 4WD plug-in hybrid system, which can help the concept drive in all weather conditions and road surfaces. A large capacity drive battery is fitted in the floor powering two electric motors in the front and rear while opening up more passenger space in the three-row cabin. Those electric motors will pair with a 2.4-liter four-cylinder engine, which can power the drive wheels or act as a generator to charge the batteries. This being a plug-in hybrid, the Engelberg can run in hybrid mode or rely on the electric motors by themselves. Mitsubishi is promising an electric range of around 43 miles on the European WLTP testing standard and a total driving range of over 434 miles with the batteries and fuel tank topped up. Like the Nissan , meaning owners can use the batteries to power their homes. The system is called the Dendo Drive House system and it will likely appear on future Mitsubishi models. As you can tell from the concept's rugged design, it was built with off-roading in mind. The Engelberg uses a full-time 4WD system with "know-how developed from Lancer Evolution series." That's right, this hybrid SUV actually borrows something from the coolest car Mitsubishi ever built. Like an Evo, the Engelberg uses Active Yaw Control (AYC) to split the torque between the front wheels. The AYC system pairs with Super All-Wheel Control (S-AWC) to deliver confidence-inspiring traction over all terrain. Mitsubishi didn't mention any production dates but we hope the Engelberg reaches the lineup as a spiritual successor to the old Montero. This concept certainly doesn't look production-ready with its funky wheels and lack of exterior mirrors but it is finally a Mitsubishi enthusiasts can look forward to. 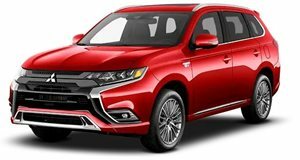 2018 Mitsubishi Outlander PHEV Test Drive Review: About Time! A plug-in hybrid in a practical crossover – this might be a hybrid that people actually want!